In a year dominated by uncertainty and volatility, corporate bonds provided a stable anchor to portfolios. They did not react to either the highs or the lows of the equity market. Source: Bloomberg and Australian Corporate Bond Company. Corporate bonds are represented by a portfolio of all Fixed-Rate XTBs. 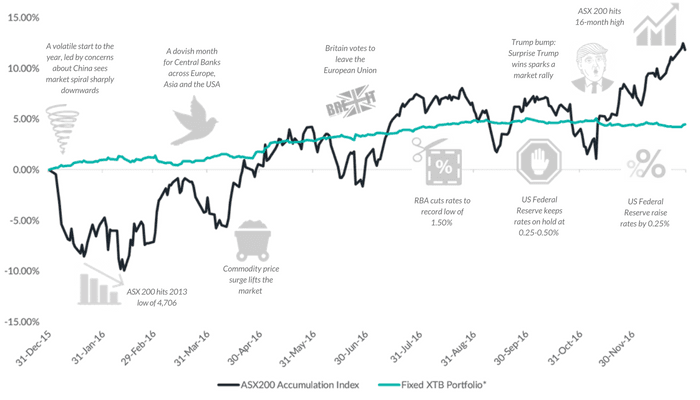 From Brexit to the election of Donald Trump, 2016 was a year of political turbulence, which could influence and reshape the global economy in the near future, particularly regarding trade, bilateral relations and immigration. A volatile start to 2016 for the markets, culminating with the Bank of Japan becoming the latest major central bank to implement negative interest rates. The European Central Bank held back from injecting more stimulus, keeping the door open to more action in March. In the U.S., figures showing the economy sputtered in the final three months of 2015 added weight to the argument the Federal Reserve would rein in plans to raise interest rates. Concerns about China’s economy led Bloomberg Intelligence Economics to use its in-house GDP tracker to assess the true rate of the country’s growth. The Brexit debate intensified as the U.K. announced its EU referendum for June 23. In the euro area, the European Central Bank Spectrometer pointed to policy makers injecting further stimulus at the March meeting. U.S. data releases suggested further monetary tightening is still on the way from the Fed, though at a slower pace. In Asia, the People’s Bank of China cut the reserve requirement ratio on Feb. 29, and Bank Indonesia lowered its reference rate earlier in the month. A dovish month for central banks. The European Central Bank cut its already-negative deposit rate even further, while the Bank of England governor Mark Carney warned that an exit from the European Union was the biggest risk to the U.K.’s financial stability. The Federal Reserve cut the number of expected fed funds rate increases this year to two. The departure of a hawkish member of the Bank of Japan in March increased the chances of more stimulus coming as soon as the end of April. Meanwhile, China’s rising debt burden led to a symbolic downgrading of its credit-rating outlook by Moody’s Investors Service. In politics, there was some bad news for Donald Trump as the Misery Index pointed to the next U.S. president being a Democrat. GDP figures showed the euro-area economy had finally returned to pre-crisis levels after eight years. That is almost three years later than the U.K. and some six years later than the U.S. Still, as in recent years, the U.S. economy performed dismally in Q1, while the U.K. economy lost momentum, partly reflecting the uncertainty linked to the June 23 EU referendum. Meanwhile, China’s quarter-on-quarter and year-on-year rates of GDP growth for the past year did not match, adding to scepticism about the economy’s true rate of expansion. A vote by Brazil’s lower house of Congress authorized the start of the impeachment process for President Dilma Rousseff. Data releases in May suggested that major central banks would remain on hold in June. The U.S. economy’s weak performance closed the door on an interest-rate increase at the Fed’s June meeting. The threat of the U.K. leaving the European Union on June 23 was another reason for the Fed to wait before tightening again. Meanwhile, Japan had looked set to remain on hold in June partly as a result of strong wage data released the prior month. May also marked a turning point in China as the government revealed it was now prepared to shift focus towards containing financial risks, making further rate cuts less likely. June will be remembered for the Brexit shock. Britain’s unprecedented decision to leave the EU clearly caught financial markets off guard. Uncertainty over future trade arrangements and market access will likely lead to investment decisions being postponed and slower economic growth. The next move in U.K. interest rates is now set to be a decrease. Data from the U.S. to China had already hinted at a slowdown even prior to the June 23 referendum. The May U.S. jobs report had upended Fed aspirations for a midyear rate increase. The Brexit vote further diminished that possibility, while strengthening the case for easing by the Bank of Japan in July. The Brexit vote saw only a restrained response from central banks in July. The Bank of England held major action until August, while the European Central Bank didn’t send any clear signals about its next move. The Bank of Japan’s expanded stimulus underwhelmed at month-end. And the Fed still looked likely to raise rates, albeit just once this year, following the U.K.’s decision to leave the EU. The Bank of England cut interest rates to a 322-year low to temper the fallout from the U.K.’s vote to leave the EU. Across the Atlantic, comments by Fed Chair Janet Yellen supported the notion of a rate hike this year. A People’s Bank of China statement added to evidence that the government’s focus is shifting toward containing risks to financial stability. Meanwhile, India named a successor to central bank Governor Raghuram Rajan. The fallout of the Brexit vote was not as bad as feared in September. At the same time, the impact on the euro area is likely to be worse than the European Central Bank predicts and that could mean further easing is required. Troubles at Deutsche Bank added to global risks. The Fed appears to be aiming for a December rate hike – after the Nov. 8 elections. Meanwhile, the Bank of Japan shifted its policy framework to focus on controlling the yield curve. October’s economic data suggested a shakier position for Hillary Clinton. The U.S. Misery Index continued to signal the Democrats would keep the White House, but with a narrower path to victory. There was also growing evidence the Federal Reserve was preparing to hike interest rates in December, while the European Central Bank seemed inclined to ease policy at year-end. Bloomberg Intelligence estimated that the U.K.’s decision to leave the European Union will trim about 0.5% from the level of euro-area GDP by 2018. China’s yuan gained new status in October as a member of the International Monetary Fund’s Special Drawing Rights (SDR) basket. Still, data suggested that the yuan’s global role may in fact be diminishing. Meanwhile, Reserve Bank of India’s governor Urjit Patel kept rates on hold at his debut meeting. November began with a political earthquake, as Donald Trump’s victory sent shock waves across the world. There was yet more evidence the Fed was preparing to hike interest rates in December, while the European Central Bank was likely to ease policy further. The U.K. chancellor kept the focus on deficit reduction at his first major post-Brexit fiscal event. Elsewhere, China’s growth outlook appears little changed for 2017. That is contingent on President-elect Trump steering clear of protectionism. The last month of 2016 echoed that of last year, as the Federal Reserve again raised interest rates. BI Economics assessed the risks to the Fed outlook as tilted toward two hikes in 2017 instead of three. In contrast, the European Central Bank’s extension of quantitative easing underscored the policy divergence between the U.S. and euro area. Politics continued to play havoc in December, though Italy’s referendum outcome doesn’t make an EU exit likely. The U.K.’s economic resilience could be tested next year. While China’s economy looks to have stabilized, uncertainties remain over the potential impact of new U.S. trade policies. In India, the consensus view is that demonetization will have a large negative impact on short-term growth.